Once the shock passed and the tears dried, Patricia Rizzi decided something good would come from unspeakable tragedy. Patricia Rizzi, UT’s annual Jefferson Award Champion, posed for a photo with Greg Moore, national director of the Jefferson Awards for Public Service, left, and UT Vice President Lawrence Burns. After enduring the death of her daughter in 2000, the registered nurse decided to focus on doing her best to ensure other mothers would not experience the same type of pain. For her efforts against domestic violence, Rizzi was named UT’s second annual Jefferson Awards Champion honoree during a Feb. 15 luncheon in Libbey Hall. The event recognized 12 Jefferson Award winners selected in 2009. 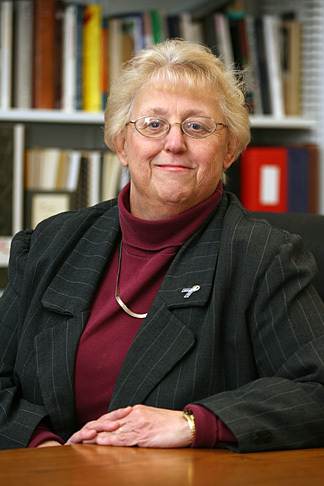 Rizzi, who has worked on Health Science Campus for more than 25 years, was UT’s third honoree in 2009. Rizzi’s nomination, however, had the committee that selected the annual honoree spellbound. In the late 1990s, Rizzi’s daughter, Michelle Rizzi Salerno, a graduate student at Michigan State University, became entangled in an abusive marriage. After Michelle’s murder, Rizzi found herself at a spiritual crossroads. She chose the latter, driven by the memory of the daughter she lost. Beginning in her own backyard, Rizzi spearheaded efforts to enhance The University of Toledo Medical Center’s policies regarding domestic violence, promoting better awareness of abuse and ensuring victim resources are readily available in treatment areas. A member of the Lucas County Domestic Violence Task Force, Rizzi often recounts her daughter’s story during public awareness events, such as Take Back the Night and Silent Witness. Silent Witness is particularly moving, as life-sized silhouettes create solemn displays to commemorate victims. The figure for Michelle Rizzi Salerno was northwest Ohio’s first silent witness. UT began its Jefferson Awards program last year to recognize the unsung heroes of volunteerism within the campus community. One honoree is selected each month from nominations submitted through the Jefferson Awards Web site at www.utoledo.edu/jeffersonaward. Last year’s honorees were students Linda Amrou, Luc Blazejewski, Michael Miller, Natalie Powers, Will Schmitt, Mark Skopin, Emily Stinehart and Alex Wise; faculty member Dr. Barbara Kopp Miller; and staff members Connie Donald, Sue Kielczewski and Rizzi. As UT’s annual honoree, Rizzi has the opportunity to attend a national Jefferson Awards seminar this June in Washington, D.C. Greg Moore, national director of the Jefferson Awards for Public Service, was on hand to congratulate Rizzi during the luncheon. 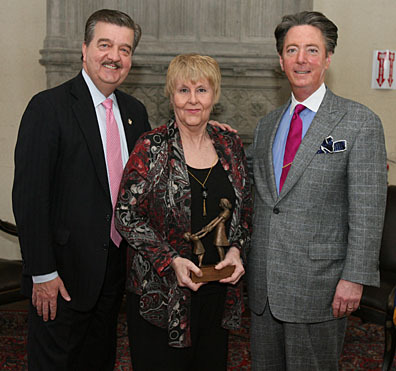 Rizzi accepted the honor from Stinehart, last year’s annual honoree. The University of Toledo women’s basketball team raised $11,393.15 for the Susan G. Komen For the Cure of Northwest Ohio at its second annual “Rockets For the Cure” game vs. Western Michigan Feb. 13. Toledo had two victories to celebrate — the 65-41 win over the Broncos and raising funds for a good cause. The pink Nike jerseys that the team wore were made especially for the game. Some of the jerseys that were auctioned off after the game went for $1,000 or more. WTOL News Anchor Chrys Peterson, the guest emcee for the second consecutive year, announced raffle winners during timeouts and also told the crowd of 4,225 more about Susan G. Komen For the Cure. Many in the crowd wore pink; this included some who donned “Rockets for the Cause” T-shirts, courtesy of Corner Dental. A total of $13,020.65 was raised through a combination of a live auction of the players’ pink game jerseys, the raffle, the sale of T-shirts and donations. All proceeds minus the costs of the team’s uniforms went to Susan G. Komen. Toledo’s final regular season home game will be against Ball State Saturday, Feb. 27, at 4:30 p.m. in Savage Arena. In the time it takes for a kid to enjoy a dish of ice cream, the girl’s childhood was blighted forever. A familiar neighborhood park, an unguarded moment, an opportunistic predator: an all-too-familiar combination. Pamela Crabtree, business service officer at the UT Urban Affairs Center until her retirement March 1, wants to make the story as rare as it is tragic. She knows the lifelong consequences of abuse; she was the young girl in the park. While she’s looking forward to the rewards of retirement — travel, more time with her husband and three grandsons — the avocation she’s anticipating most eagerly is promoting Yell & Tell: Stop Child Abuse Now Inc., the nonprofit she founded in 2003. Its Web site is www.yelltell.org. “Yell and Tell came out of my own experience,” she said. “I had kept my childhood abuse a secret; I hadn’t told anybody until I was in my mid-40s.” That was when her husband was kidnapped in a carjacking and robbery, a harrowing experience that Crabtree recounts in her book, The Gift of Hurt. (Read a synopsis at www.pamelacrabtree.com.) Though her husband survived his ordeal, it left the couple emotionally scarred. “We both were suffering from PTSD [post-traumatic stress disorder], so we went into therapy. That brought up all manner of garbage, which included talking about my abuse. Therapy opened Crabtree’s life in other ways. She earned an adult liberal studies bachelor’s degree from UT in 1997, following it with a master’s in 2004. “My master’s thesis has a long title — much of it is research on ramifications and statistics of child abuse,” she said. Instead, it was a beginning. Subsequent rallies held locally keep growing, with the seventh annual rally scheduled for Sunday, June 27, at the Walbridge Park Shelter House in south Toledo. This year the Yell & Tell rally will offer free hot dogs, chips and sodas along with educational materials and exhibits by community organizations. Mark Robinson, assistant director for the Northcoast Fatherhood Collaborative, will provide the keynote address. Crimes against children have an economic side as well, she added: more than $1,400 yearly in indirect costs for each Ohio family. “If we start taking care of our children, protecting them, we raise healthier children who are less likely to enter the justice system or psychiatric treatment or substance abuse,” she said. Because electronic devices become obsolete faster than any other tools used, and most contain hazardous and environmentally damaging materials, both the cost and consequences of disposing of these devices can add up fast. The University of Toledo has partnered with Affinity Information Management (AIM), electronic recycling and document destruction specialists located in Sylvania, to handle the disposal of all campus electronic equipment. Before switching to AIM, broken or obsolete equipment had to be taken apart, separated by component, and individually packaged before it could be collected for disposal. Now equipment from any campus location will be picked up and recycled within 48 hours of notification. Free pickup can be arranged for most electronic devices, including computers, laptops, printers, modems, radios, cables, cell phones, monitors, telephone equipment, game consoles and fax machines. For more information, contact Royer at 419.530.4942. On Tuesday, March 2, UT’s Public Relations Student Society of America (PRSSA) and several other organizations will host the Student Organization Gala from 6 to 10 p.m. in the Student Union Auditorium on Main Campus. Themed “A Historic Night,” the gala will include an evening of fine dining, dancing and PhotoBoothLive to celebrate all active student organization members and their hard work and dedication throughout the year. The purpose of the gala is to encourage more collaboration between student leaders and organizations on campus. “Ultimately, we would like to bring everyone on campus closer together,” Hickey said. If you are a member of a UT student organization and are interested in attending the Student Organization Gala, RSVP by sending your name, student organization and phone number to utstudentgala@gmail.com. 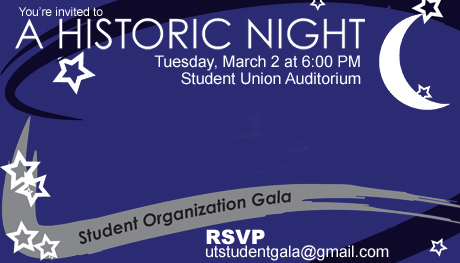 Space is limited, so be sure to check out the UT Student Organization Gala Facebook page for updates. Dr. Sam Spann has been named director of academic engagement in the UT Office of Academic Engagement. He will lead the areas of study abroad, study away, service learning and community engagement. He also will work with the Washington Center Internship program and Camp Adventure. Spann will advise students who need guidance in exploring these options. He will work closely with the Division of Student Affairs to bridge Academic Affairs and Student Affairs with regard to community outreach, international activities and student engagement. Spann began his position in January. His office is located in Sullivan Hall. He has worked at UT seven years, previously serving as director of Camp Adventure. He is an alumnus of the University; he graduated in December with a doctorate in special education. The Office of Academic Engagement is a member of the UT Learning Collaborative that works to support and enhance the academic journey. The University of Toledo Hockey Club will host a game versus Cincinnati Saturday, Feb. 20, at Tam O’Shanter Ice Arena, 7060 Sylvania Ave in Sylvania. Not only will the Rockets be facing off with the Bearcats, but the team also will be playing to help fight cystic fibrosis. To kick off the event, there will be a free skate from 1 to 2:20 p.m., provided by the Glass City Federal Credit Union, as well as free pizza until 3:30 p.m. when the UT-Cincinnati game will start. Raffles will be held throughout the game. Prizes ranging from gift certificates to Detroit Red Wings tickets will be given away, thanks to donations from local businesses. A $250 Omni VIP Washington Suite for six guests also will be up for grabs. Tickets for the game are $7 for adults and $4 for students. All proceeds will benefit the Cystic Fibrosis Foundation. 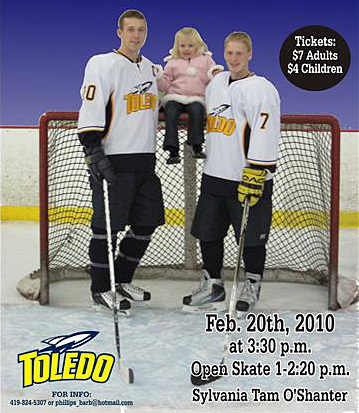 For tickets or more information, contact Barb Phillips at 419.351.9721 or go to www.utoledohockey.com. The University of Toledo Department of Theatre and Film’s 2009-10 season, “Style & Substance,” will look at the Theatre of the Absurd with two plays from one of the genre’s masters, Eugene Ionesco. The plays, “The Lesson” and “The Bald Soprano,” will run back to back with a brief intermission Friday, Feb. 19, through Sunday, Feb. 21, and Wednesday, Feb. 24, through Sunday, Feb. 28. Curtain time in the Center for Performing Arts Center Theatre will be 7:30 p.m., except Sunday performances, which are at 2 p.m.
Far from being just silly or farcical, the Theatre of the Absurd emerged as a reaction to the ridiculousness of the atrocities of World War II that followed those of World War I within the span of one generation. It demonstrated how humanity was disconnected from its own experiences and had not learned from its previous mistakes. Ionesco attempted to take the larger scale of life and compress it so that one character becomes the representation of a social, ethnic or political group and one person’s entire life condenses into one evening. In “The Lesson” and “The Bald Soprano,” Ionesco’s characters are oblivious to the nonsensical way they think, act and live. He exposes their absurdities to the audience in a way that is at once funny and yet unsettling and disturbing. “The characters are people who are unable to connect with each other, unaware of their own actions and the results of their actions, and who therefore put themselves in absurd situations while being completely oblivious to these situations,” said Cornel Gabara, UT assistant professor of theatre, who directs the production. In the first play, “The Lesson,” a professor grows increasingly frustrated with what he believes is an incompetent student. But is the student really incompetent or does the professor fail to teach? The second play, “The Bald Soprano,” takes the setting of a seemingly banal and quiet evening dinner with friends and reveals a possible progression of events triggered by a random train of thoughts, random association of concepts and ideas caused by the short span of awareness of the people involved. Tickets are $13 for general admission; $11 for faculty, staff, alumni and seniors; and $9 for students. They can be purchased online here, by calling 419.530.2375, or by visiting the Center for Performing Arts Box Office Monday through Friday between 9 a.m. and 6 p.m.
Ward M. Canaday Center acquires historical records of Dana Holding Corp. The University of Toledo’s Ward M. Canaday Center for Special Collections recently added approximately 180 linear feet of records documenting the history of the Dana Holding Corp. to its holdings. The collection joins those of other major Toledo corporations preserved in the Canaday Center, which keeps the records of Libbey-Owens-Ford, Owens-Illinois Inc., Owens-Corning and Toledo Scale, according to Barbara Floyd, director of the center. “This is a wonderful addition to our collections documenting Toledo business and industry. The collection should prove valuable to researchers interested not only in Toledo’s history, but the history of the automobile industry nationally and internationally,” Floyd said. 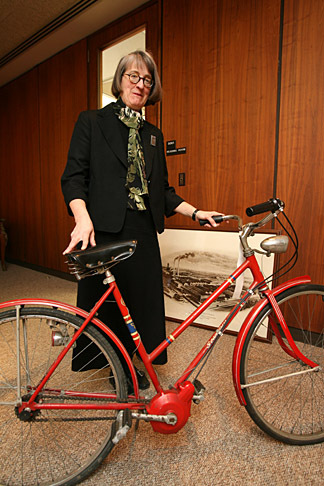 Barbara Floyd showed off a bicycle fitted with a three-speed Dana transmission circa 1970. The bike is among the Dana Holding Corp. items now housed in the Canaday Center for Special Collections. The Dana collection documents the company from its founding in 1904 by Clarence Spicer to recent years. The materials were previously stored at a facility in Virginia, but Dana decided recently to relocate them to the local area where the company has been headquartered since 1929. “It is wonderful that our community’s history is back in Toledo,” Floyd added. The collection includes administrative materials, company publications, advertising and sales materials, public relations files, photographs and a few artifacts. Of particular interest is the original patent for Spicer’s universal joint from 1903 that was the basis for the company’s founding. Prior to Spicer’s development of the universal joint, automobiles transmitted engine power to the wheels through two sprockets connected by a chain. The system was loud and unreliable, and frequently broke down because it was difficult to lubricate. Spicer, who was attending engineering school at Cornell University at the time, developed a system that employed a universal joint at each end of a tubular shaft. The joints were encased in a housing to retain lubrication and shield it from road debris. While the universal joint has existed since the 1500s, Spicer’s improvements were immediately recognized by the fledging automotive industry as important to improving sales of their products. Many contacted Spicer seeking permission to manufacture the system, but Spicer decided to open his own plant in Plainfield, N.J. Soon manufacturers began to redesign their autos to accommodate Spicer’s ever-improving designs. During his life, Spicer was issued 27 U.S. patents and five French patents. 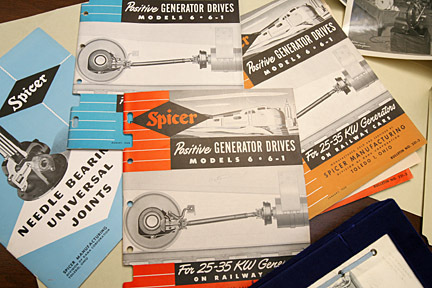 But for Spicer, the success of his products meant difficulties in keeping up with demand. He needed to expand, but lacked the capital to do so. In 1913, Charles Dana, a prosecuting attorney from New York who was the grandson of the man who founded the New York Sun newspaper, lent the company $15,000. Within two years, Dana owned nearly half the company and became president. By 1929, three automobile manufacturers were dominating the American car market — Ford, Chrysler and General Motors, all of them located in Detroit. To be closer to its main markets, Dana moved that year from New Jersey to a new complex on Bennett Road in Toledo. While the Depression dampened demand, the outbreak of World War II led to the need for military vehicles. Most importantly, Spicer Manufacturing produced the transfer cases, universal joints, propeller shafts, and front and rear axles for Willys-Overland’s General Purpose, or Jeep, war vehicle. At the end of the war, the company changed its name in recognition of the person who served as president for 32 years, Charles Dana. The company continued to expand and diversify. Between 1966 and 1979, Dana’s sales grew from $450 million to more than $3 billion annually. In the 1970s, the company became known for its innovation and unique leadership style under president Rene McPherson. It was under McPherson that the company’s corporate headquarters moved out to Dorr Street across from the Inverness Country Club. In the past 10 years, the downturn in the North American automobile industry has clearly impacted the company. In March 2006, Dana’s U.S. operations filed for Chapter 11 reorganization. Dana successfully emerged from Chapter 11 in February 2008 with a new board of directors, a new chairman, and a renewed focus on returning the company to a leadership position in the global vehicular supply industry. Last year, Dana sold its headquarters building on Dorr Street to another Toledo-based company and relocated its corporate staff to its technical center in Maumee. When the collection is eventually organized, it will be made available to researchers in the Canaday Center. Three community presentations have been planned to share with students the possible future of dining services on campus. On Thursday, Feb. 18, students can listen to the recommendations from Aramark and provide their input at 3 p.m. in the Ottawa East Multipurpose Room. Another session will take place Feb. 18 at 7 p.m. in the Student Union South Lounge, and the final presentation is scheduled for Friday, Feb. 19, at noon during the Student Advisory Board meeting in Student Union Room 2591. Last fall semester, UT partnered with Aramark on a comprehensive, strategic process designed to develop a blueprint for the future of the dining program at the University. Key information regarding campus demographics, academic class schedules, enrollment projections, short- and long-term renovation plans, on-campus housing statistics, and other relevant data were studied. Interviews were conducted with 29 key administrators and student organization representatives to understand the perceptions and attitudes about dining services on campus. In addition, more than 500 students, faculty and staff participated in a survey to determine overall performance ratings on various attributes of the dining program, and a traffic analysis was completed to determine areas that need relief. The dining services strategic plan is an ongoing process, but Aramark’s recommendations include putting a small grab-and-go snack counter in the new Savage & Associates Complex, replacing KFC in the Student Union with Chick-fil-A or Raising Cane’s, and adding a venue in this same space that would change for breakfast and lunch. Aramark also recommended installing a Java City Café in the Memorial Field House to offer students, faculty and staff another place to order specialty drinks and grab-and-go snacks.